A string of violent incidents reveals some festering problems in India’s military. A string of incidents involving indiscipline and insubordination in the Indian armed forces has set off alarm bells in India’s defense establishment. Since May last year, there have been at least four violent clashes between officers and jawans (soldiers) of the Indian army. Two of these occurred over a span of five days last month. On October 10, jawans of an infantry battalion in Meerut near New Delhi beat up officers after an altercation over a boxing match. The officers had reportedly “roughed up” a jawan for losing the match. Four days later, the commanding officer (CO) of a battalion in Batala in Punjab was assaulted when he took disciplinary action against a jawan for reporting late to work. In May last year, the army witnessed one of its most serious cases of indiscipline when officers and jawans of an artillery regiment in Nyoma in eastern Ladakh were involved in a brawl. The unit was training at a firing range some 20 km from India’s disputed border with China when its soldiers, enraged at officers who had bashed their colleague and then denied him medical treatment, went on a rampage, even occupying the armory. While the army sought to downplay the gravity of the incident by describing it as a “minor scuffle,” “at worst an isolated act of indiscipline,” it was nonetheless clearly rattled. This, after all, was the most serious breach of indiscipline in the army since 1984, when Sikh soldiers mutinied following military operations to flush out militants from the Golden Temple. 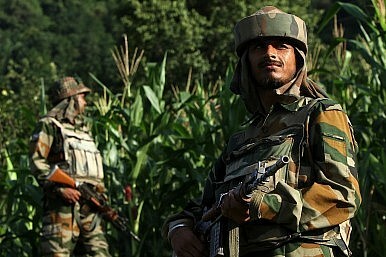 Barely had the dust kicked up by the Nyoma incident settled than another jolt came, this time from an armored unit at Samba near India’s border with Pakistan. Jawans here protested against their commanding officer when one of their colleagues shot himself on being denied leave to go home. The 1.2 million-strong Indian army is the world’s third largest and widely regarded as a professional force. Its soldiers are highly motivated and trained to cope with pressure. However, there are “worrying signs” that “all is not well” in the armed forces, a retired army doctor (who asked that his name be withheld) told The Diplomat. Especially over the past decade, personnel are turning their guns on each other and themselves. And they are leaving the armed forces in droves. The figures are worrying. Between 2001 and 2011, 1330 personnel in the army, navy and air force committed suicide, with the army alone accounting for 1056 of the cases and displaying a troubling uptrend. There were also 75 deaths from fratricide during this period, with the army accounting for 72 of these. In fact, the army seems to be losing more men to suicide and fratricide than to enemy bullets. The number of soldiers who die “battling their internal demons” is said to be four times the number killed in counter-insurgency operations in India’s conflict-wracked Kashmir and the Northeast. Given the nature of their job, stress is inevitable among soldiers the world over. The problem has deepened in India as soldiers are deployed to deal with insurgencies over prolonged periods. Because of operational requirements and a shortage of personnel, they are rarely given time off to visit their families or to deal with problems back home. Vacation time to go home is primarily meant for jawans to rest and recoup. However, when they go home, they are preoccupied with “tackling land disputes, without any fruitful results.” When they return to work with the “enhanced burden” of unresolved domestic issues on their minds, he said, their motivation at work and emotional and mental well-being suffers. Besides personal/domestic matters there are issues at work that stress soldiers. And increasingly, the rank and file are unwilling to endure quietly humiliating treatment meted out to them by the officers. An official in the Ministry of Defence (MoD) attributed growing insubordination in the army to increasing awareness among jawans. “Unlike in the past, when there was a big gap in their socioeconomic backgrounds, jawans today, especially those from urban areas, are educated. “They do not consider themselves as inferior to the officers.” In addition, corruption scandals involving officers have contributed to undermining the stature of the officer class in the eyes of the lower ranks. Indeed, an extensive study by Dixit on stress in the army, which was based on surveys conducted among soldiers and drew on published material and reports, found that “most cases of fragging” were the outcome of “humiliating taunts by seniors on mundane matters.” “Humiliating comments,” he wrote, trigger “emotions of revenge in the already aggressive solider,” prompting him to turn his weapon against his seniors. The role of the sahayak (personal valet) system in institutionalizing humiliation of jawans is hard to ignore. A colonial institution wherein officers were assigned what were then called “batmen” or “orderlies,” the sahayak system survives today. The sahayak is meant to assist the officer so as to free him to focus on his work. His support is vital to the officer’s efficient functioning especially in field areas. Indeed, Dixit describes sahayaks as “an inescapable requirement in training and operations” and that their working together there cannot happen unless sahayaks work with officers in peace areas too. However, the system has been gravely misused with some officers expecting their sahayaks to do menial tasks in their homes. A major who took premature retirement from the army in 2005 told The Diplomat that several sahayaks “help the officer’s wife with her shopping, polish his children’s shoes and even walk the dog.” It “deeply undermines” the morale of a soldier, he observed. What is more, the sahayak system has encouraged officers to look upon their sahayaks as their personal property to be dealt with as they wish. And jawans are increasingly unwilling to accept the ill-treatment handed out. This was underscored in the Nyoma incident. It was the brutal thrashing of a sahayak by officers that triggered the “revolt” by the soldiers. The army is not taking the incidents of indiscipline lightly. Following the Nyoma incident, for instance, an Army Court of Inquiry recommended disciplinary action, with court martial proceedings against 168 personnel, including the unit’s commanding officer. Handing out “exemplary punishment” has some deterrent value in dealing with indiscipline. But this is a symptomatic approach that leaves underlying problems festering. Military authorities have raised the issue of land-related problems of soldiers with the government through the defense ministry. “But the government does little beyond issuing advisories to the state governments to ensure that local officials are more responsive to jawans,” Dixit said. “Until such time the home ministry and revenue ministry at the central and state levels prioritize settlement of land disputes involving soldiers,” this major stress factor for soldiers will remain alive. According to Dixit, there are “adequate and fair mechanisms to address soldiers’ complaints of unfair treatment/humiliation by their seniors.” A jawan can seek an interview with his commanding officer and if he is not satisfied with the outcome he can meet officers higher up in the chain of command. If these options prove unsatisfactory in redressing his grievance, he can appeal to the army tribunal court. Similarly, there are support systems to help soldiers deal with personal stress and crisis, he pointed out. The question is whether these support systems and mechanisms for redress are working efficiently. Defense ministry officials deny they are indifferent to the problems of the lower ranks. Several measures, including a liberalized leave policy, provision of family housing to personnel in peace areas, enhanced officer–soldier interaction, upward revision of salaries, creation of a pool of counselors at the unit level, etc. have been taken to address “stress triggers” in the armed forces. The sahayak system is on its way out, the MoD official pointed out, drawing attention to the army’s announcement last year that it was considering doing away with it. The defense establishment may be taking steps to address the problems but these seem cosmetic, scattered and piecemeal at best, underscored by the governments’ insubstantial handling of key sources of soldiers’ stress such as the land-related issues and the army’s officer- class’ colonial era/feudal attitude and treatment of its soldiers, evident from its inaction on sahayak-related issues. Eighteen months after it announced it was considering ending the sahayak system, no steps have been taken on even reforming it. The issue is on the back-burner. It is this habit of putting issues on difficult issues on the back-burner that is erupting in violence. India’s failure to grapple comprehensively and assiduously the festering issues troubling its soldiers could prove costly. Dr. Sudha Ramachandran is an independent journalist/researcher based in Bangalore, India. She writes on South Asian political and security issues and can be contacted at sudha.ramachandran@live.in.